Many companies use brochures as promotional tools. With brochures you can present your products, or news, discounts in a very neat way and spread the word about your company. Brochures can be easily made in Microsoft Word or any other Word alternative. However, if you prefer to work online and collaborate with your colleagues via cloud, you can use Google Docs for the same purpose. 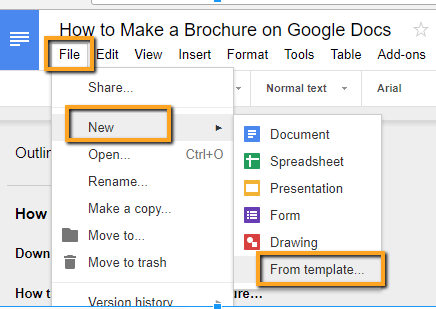 Here is how to make a brochure on Google Docs. If you are not so skilled with brochures or simply in a hurry, you can choose one of the templates from the Template Gallery. Templates can also be edited and customized in a way you want. So, let’s start by opening a Google Docs. 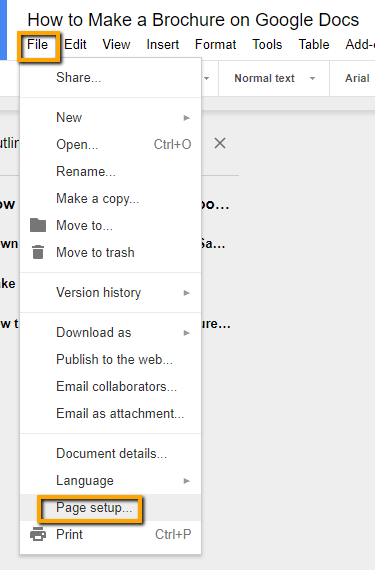 Go to the File menu, then New and From Template. The Template gallery will open and you need to press CTRL and F on your keyboard to open a search box. Type the word brochure and press Enter on the keyboard. You will see all templates that are called brochures. Choose the one you like the most and click on it. The brochure will open in a new Google docs document. The last step would be to remove the template text and write your own. You can even change images, fonts, or anything you want. Eventually, the brochure will be personalized and tweaked according to your needs. The first step in this case would also be the File menu, but instead if choosing a template, go to Page Setup. In the Page Setup options, change the page orientation from Portrait to Landscape and click OK. The second thing to do is to click the Table menu and then Insert Table. 3×2 table would be big enough for the start. Again, click the Table menu to open Table Properties. In the column width and row height, type the values. For instance, select value 3 for the column width and value 6 for row height. The final thing to do is to add content (text, graphics into table cells). The second column will be a back cover, while the last will be the front cover. Your document will be saved automatically and ready for printing. If you want to save paper you can put content on both sides of the paper. To have a double sided brochure, you just need to repeat the process explained above and copy paste the table. So, first you insert a table with three columns for example and then copy and paste it, with the right click of the mouse. Next, click on the Print button in the left top side of the screen. You will see the preview of your brochure. Click on the Print Using System Dialog to open the Print dialog with additional options. Click the Preferences button and select the Double-Sided Printing.